The Candover Valley and Benefice Choir was started by Sally Keighley in 1999. 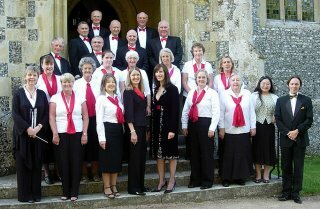 From modest beginnings, it grew to be a medium sized Choir with around 18 to 24 members from across the Candover Valley including Northington, Wield and Bradley as well as Preston Candover, Brown Candover, Chilton Candover and beyond! The Choir performs some 4 to 6 times per year and aims for a broad repertoire encompassing both sacred and secular music, including occasional performances of music theatre and light contemporary music. The Choir will occasionally sing at special church services held in the Valley, and also concerts, weddings, and funerals upon request. The Choir warmly welcomes new members — all voices welcome. For more information please visit the Choir’s website.